I did apples last week, but I have tons of stories about other kinds of trees, or really about the animals who live in them! 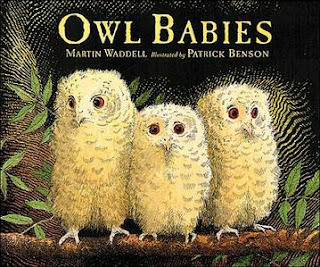 I accidentally ordered a kit with a board book copy of this book and a tiny stuffed owl, so I put the book out to circ and kept the owl. The kids are always asking what's in what looks like a hole on the story room "tree". So this week I told them that I had found something in the hole, and brought out the little owl for them to pet--gently! Then we read this book, which I have in a "big book" edition. Many of the kids tell me they have this at home--and we had it at my house too when the girls were little. But they are perfectly happy to hear it again, to giggle as I ham it up with Bill's increasingly anguished cry of "I want my mommy!" and to be reassured along with the babies, that moms always come back! Every year, I tell Jane Moncure's story "What Will It Rain?" in which a squirrel tells other animals that it is going to rain something special. They guess things like fish and carrots and oats, but it's none of those of course--it's acorns that rain down on the audience at the end of the story. I am just not creative enough to make a magnet board of this and the book is out of print. But I have just bought a used copy and am going to try to make some sort of film of it to post here. 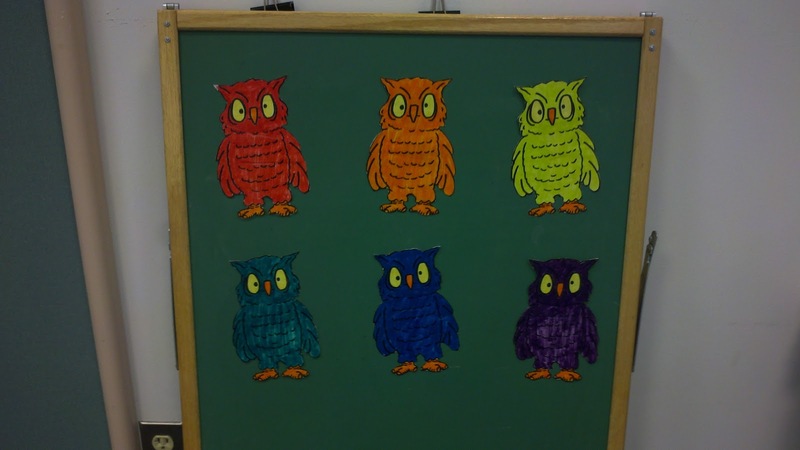 Recently I did a "Magnet Monday" posting of my "Whoo's Missing?" game--you can find it here. We played this at all the programs this week. 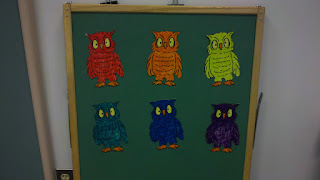 The two year old crowd couldn't do more than one or two owls, but for the three to five year old crowd we took away three and four owls and they really did well at it! I could have done even more stuff with my 3-5 year old crew, but it was the first nice Thursday in weeks. So we went outside and played with soap bubbles and sidewalk chalk instead!